At Regali we take your loved ones' prints and put them on beautiful Sterling silver chains made into necklaces and bracelets. 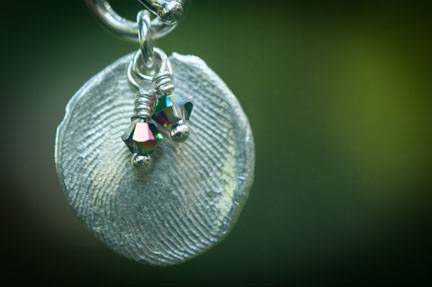 Each fingerprint charm is accented with a crystal and an initial is stamped on the back. Once we have all the details on your order we send Impression Kits to all the addresses you give us. Each kit takes less than a minute to process. Simply pop the kits into the included envelope and mail them back. It should take us 3 weeks from receipt of your fingerprints to create your jewelry. All jewelry is sent back via insured mail. Questions: Email info@RegaliJewelry.com or call 1.888.973.4254 (1.888.9REGALI). Click here to see our necklaces. Click here to see a catalog of jewelry we've completed for customers.